Federation Square is undoubtedly one of the most popular cultural precincts in Melbourne. It is a hub for events, tourism, food and wine and synonymous with venues like ACMI and NGV Australia: Ian Potter Centre. It is also a local meeting place offering many easy ways for the public to active. They range from craft lessons to community events to activities that nourish your mind, body and spirit. Whether by day or by night, there's always something happening in Fed Square. Here's a calender of things to see and do in this fantastic venue throughout the year. Best of all, these events and activities are FREE. Visit the website for detailed schedule and updates. 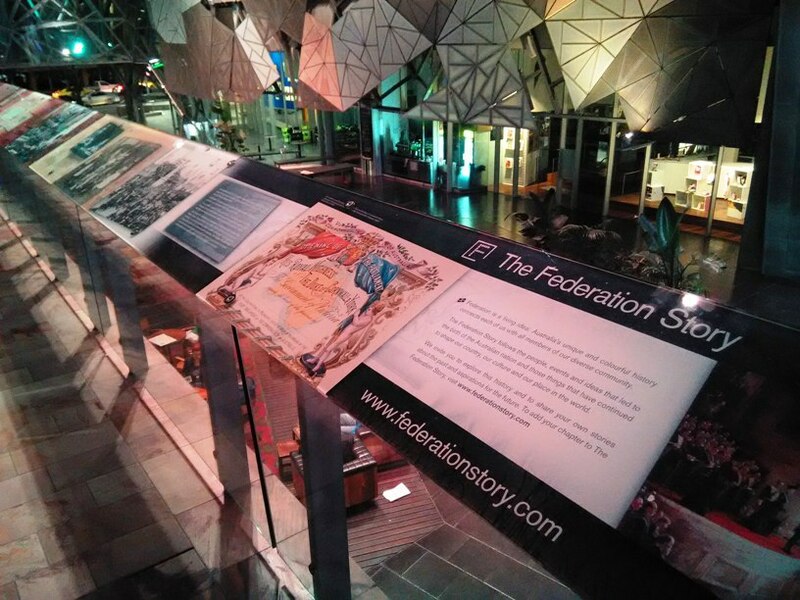 To find out how Fed Square received its name and more, just head up to the Atrium balcony. An interactive exhibition provides background information on the events, people and ideas that led to the Federation of Australia. You will learn more about Henry Parkes and also explore the factors that continue to shape Australia and its society till today. The venue is open to the public daily and all day. Laughter stretches muscles, burns calories, reduces stress and pain, and produces a natural energy booster. It also brings people together and increases happiness and intimacy. You don't have to attend live stand up comedy at Spleen or Boney to get yourself into humorous mood. There's plenty to laugh about at Fed Square thanks to Laughter Clubs Victoria. 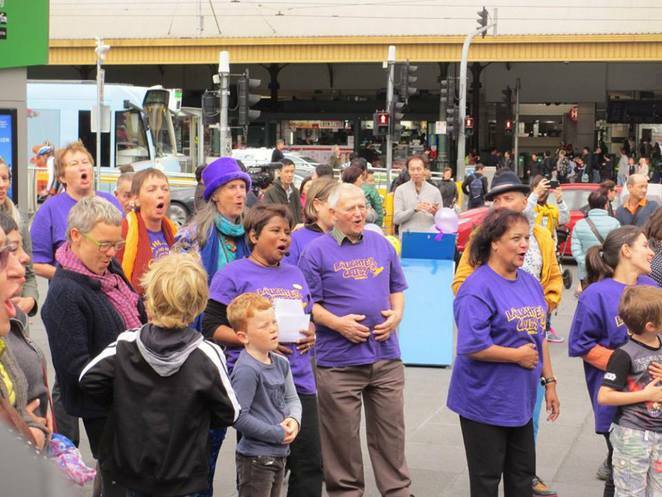 You and your family can join the crowd at the Swanston Street Forecourt every first and third Sunday of the month from 11am to 11.30am for a laughter session. Best of all, its fun and free. 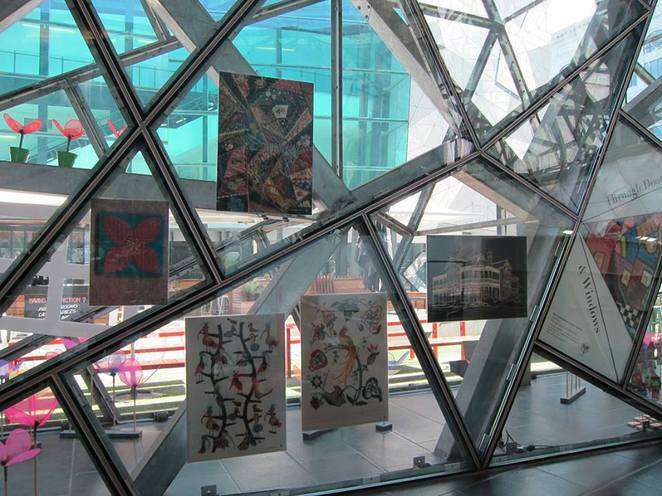 If you're interested to find out more about Fed Square, then head over to the Melbourne Visitor Centre and join the daily guided tour. The tour will explain the features that make Fed Square a cultural precinct and icon of the city include its history, architecture and engineering. The tour departs at 11am every Monday to Saturday except public holidays. There is no booking requirements but the size is limited to 15 persons. 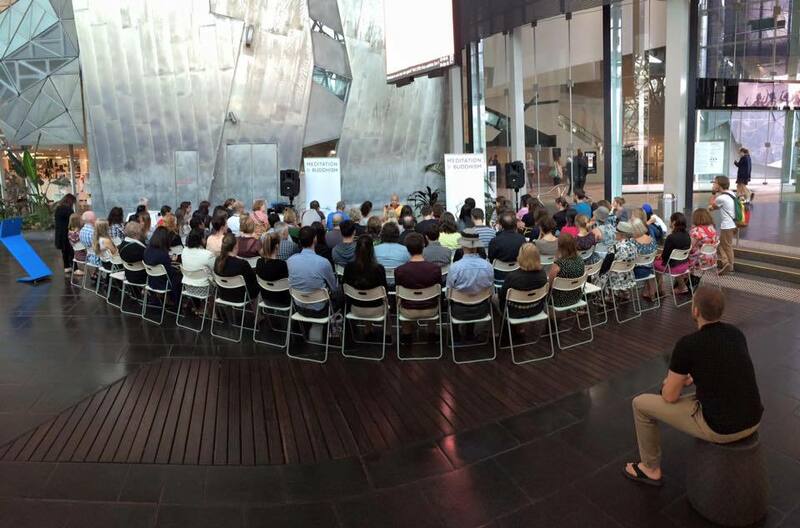 Melbourne's bibliophiles gather each Saturday at The Atrium in Fed Square to browse and purchase books. More than 5,000 books cover a variety of genres including travel, art, gardening, history, literature, fiction and many more. The Fed Square Book Market runs from 11am to 5pm. While its not the Melbourne Rare Book Fair, you can chat with authors, illustrators and some of Melbourne's most experienced book dealers, and maybe find a rare book. Join health coaches and fitness instructors from Healthy Lifestyle Lounge for group fitness classes twice a week. Each session is a circuit-based exercise that combines body weight exercises, cardio training and core strength movements. 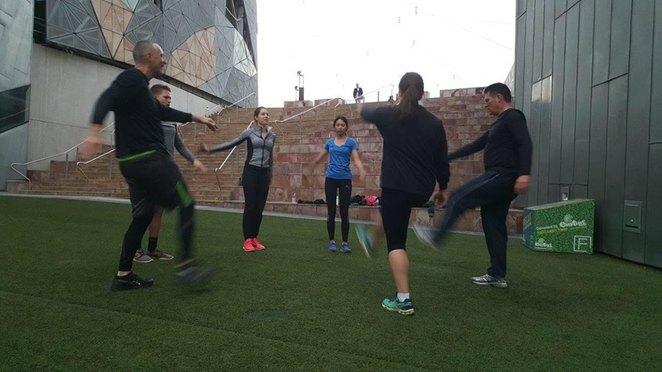 There is an evening class on Tuesday from 6pm to 6.45pm at the River Terrace and a morning class on Friday from 7am to 7.45am at the Flinders Street Amphitheatre. It is open to all ages and fitness levels. An indoor location may be used during wet weather and no classes are available on public holidays. Spend Friday mornings with Tai Chi Australia in front of the main stage at Fed Square. Expert instructors will be leading classes in Qigong, an ancient Chinese exercise that helps regulate the energy in your body and calms the mind. You will move through a series of slow exercises and regulated breathing. Classes run between 8am to 9am and open to all ages and fitness levels. Free your mind away from the hustle and bustle every Tuesday at Fed Square. Buddhist Monk Gen Kelsang Dornying, a resident teacher at the Kadampa Meditation Centre Melbourne will guide you through a meditation between 12.30pm to 1pm. Kadampa Meditation Centre Melbourne is a city-based temple where the public can discover the benefits of meditation and modern Buddhism. The session is located in the Atrium and open to all ages. Take time out during lunch for a session of yoga at the Atrium in Fed Square between 1.15pm to 2pm. Hosted by Derrick Leduc and Kaya Pilates Yoga Fitness, these Tuesday sessions help you improve your core strength and flexibility through postures, stretching and controlled breathing. The classes are open to all levels, from beginners to advanced. There is no booking required but come early to register as the class closes at 40 people. Some mats are available but it would be best to bring your own mat. Expert instructors from Tai Chi Australia will take over the open area in front of the main stage every Tuesday. You can join the group for a morning session from 7.30am to 8.30am. It is open to people of all ages and fitness level. You will get to learn and practice this Chinese martial art that promotes health and relaxation. The last Sunday of each month will see the Flinders Street frontage of Fed Square converted into a large automobile exhibition. Head on down and enjoy a showcase of different vintage, classic and even modern sports cars each month. Take photos with your favourite cars and chat up the friendly owners from 11am to 2.30pm. Head over to the Atrium on the fourth Monday of every month for knitting lessons from 12pm to 2pm. Members of the Hand Knitters Guild Victoria will share with you techniques to transform needles and yarn into useful items. 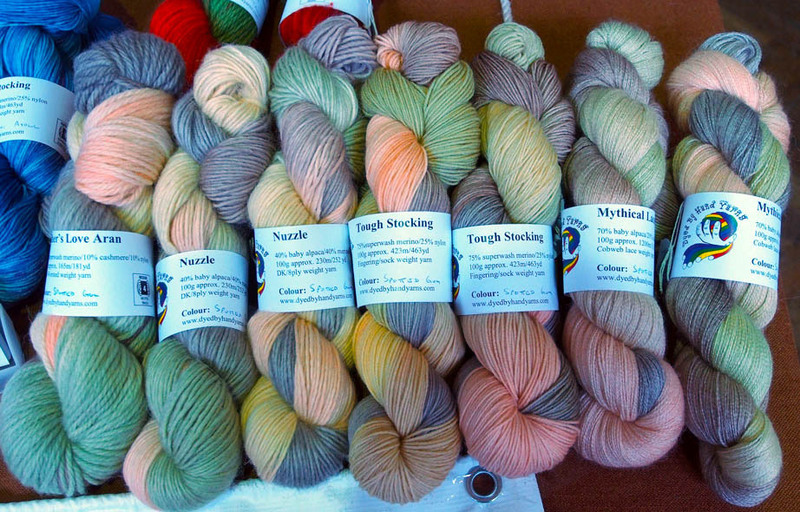 The Guild is a community knitting and crochet group based in Melbourne. Members of Papermakers of Victoria run a schedule of free monthly workshops in Fed Square from 12pm to 2pm. The organisation has promoted the appreciation of handmade paper and the paper-making craft to the public through exhibitions and workshops since 1989. 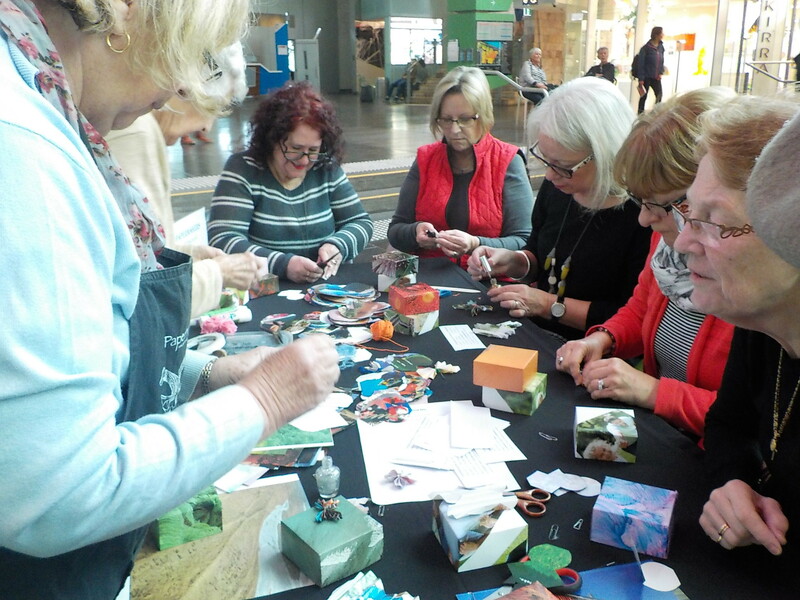 Simply join the group every third Monday of the month at The Atrium and learn how to fold, twine and mould paper into different items including gift boxes, books, jewellery, cards and many more. All materials are provided so just bring a pair of own scissors. 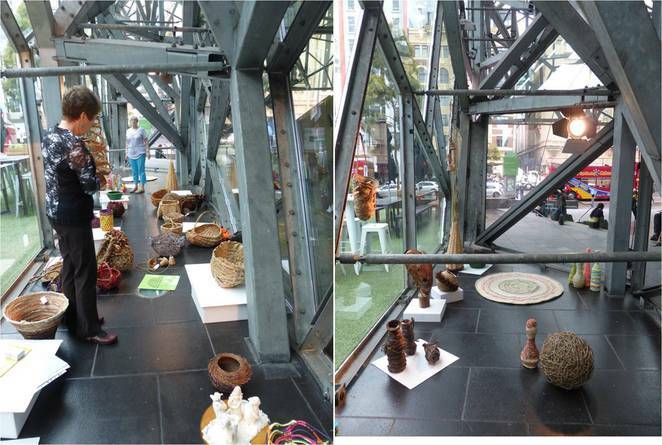 Members of the Basketmakers of Victoria are hosting workshops on the fifth Monday and fourth Friday of each month at the Atrium. You can learn the craft of basket making including different techniques that will help you create your own piece. Each class runs between 12pm to 2pm and all materials are provided. 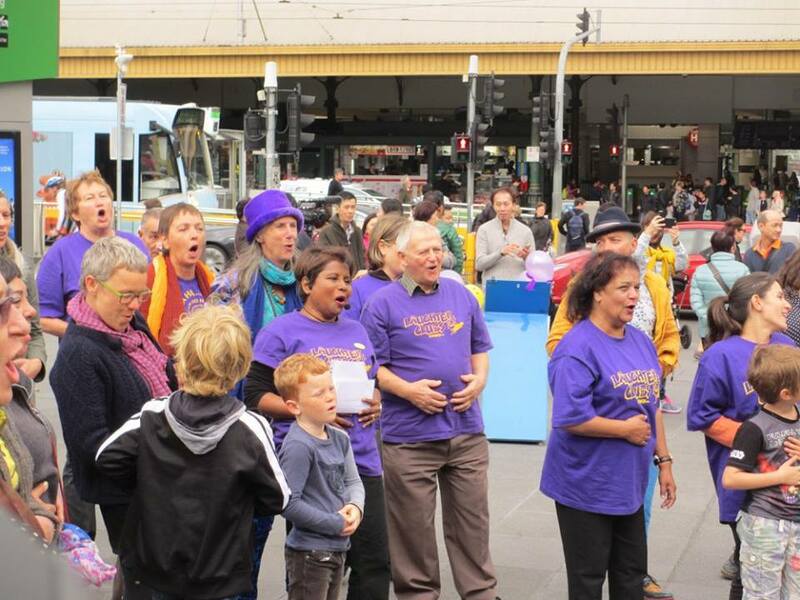 Scores of free music events resonate in Melbourne throughout the year. You can choose from lunchtime recitals in Docklands, a pop-up riverside jazz club at Hamer Hall, dance music in Melbourne Town Hall, a concert in the Shrine of Remembrance or the opening concert of the Melbourne International Jazz Festival. In addition to clubs, concert halls and art venues, you can also enjoy music all year round in Fed Square's Deakin Edge. Running from February to November, these monthly concerts serve up a repertoire of big band, jazz, contemporary pop, classics and solo performances by world-class artists and top schools in Victoria. Join the Embroiderers Guild of Victoria every first Monday of the month at the Atrium for an afternoon of embroidery. Founded in 1960, the Guild is a not-for-profit organisation which preserves the history of embroidery and fabrics through learning and sharing the love of embroidery in all its forms with the public. It has approximately 1500 members throughout Victoria including 10 Country Branches and two Country Groups. Each session runs from 12pm to 2pm and you can learn various techniques and stitch up a piece with members of the Guild. Join Calm in the City for meditation sessions every Thursday from 8am to 8.30am. Located in the Atrium, these sessions include a commentary, soothing music and some quiet. 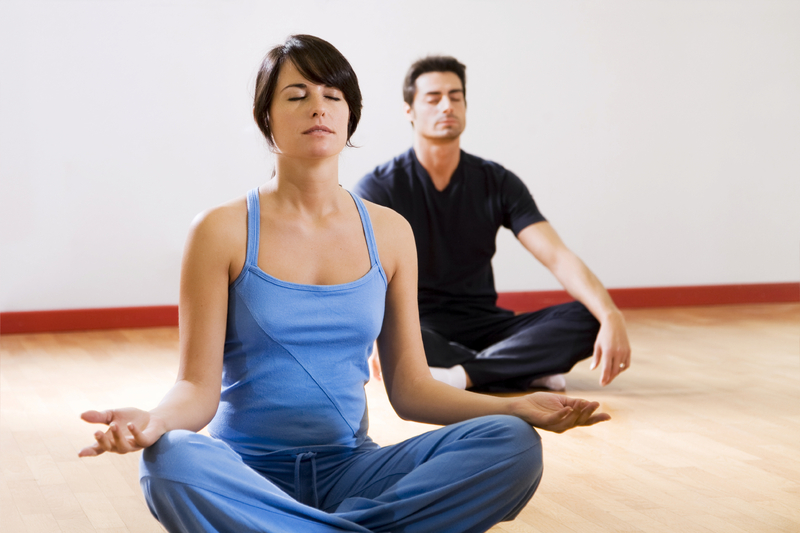 It offers a relaxing way to the start of a day for beginners and experienced meditators. Head over to the Atrium for crochet workshops every second Monday of the month with Lynn Berry and her team. These crochet enthusiasts are the pioneers behind the 5000 Poppies Project, a tribute to the ANZACs. 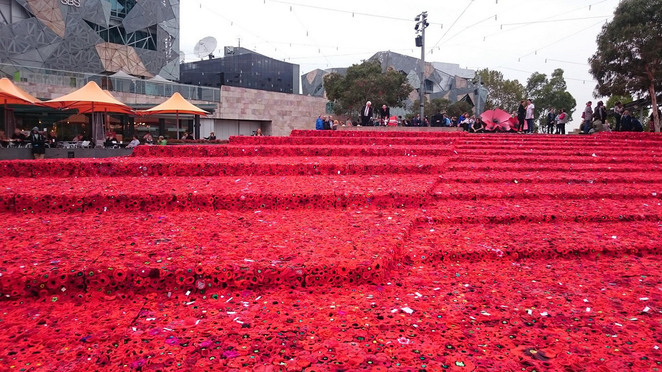 More than 250,000 crochets were made by contributors from all over Australia and overseas. 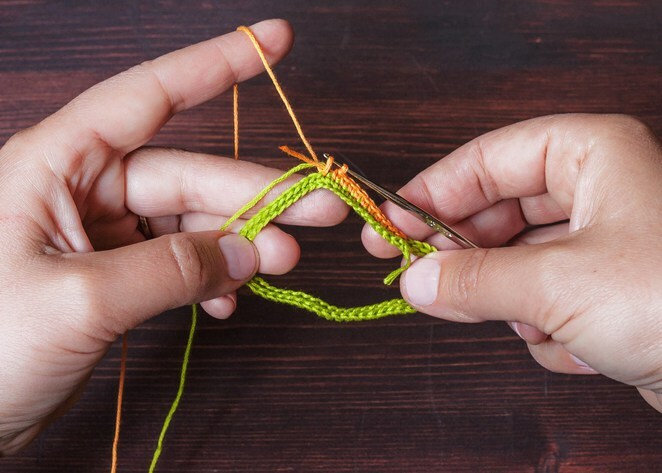 Bring along your own 3.5mm hook and some yarn and learn the craft of crochet from 12pm to 2pm. Beginners and seasoned embroiders are welcomed to join this workshop on the third Monday each month. Conducted by members of the Surrey Hills Crochet Embroidery Group, the sessions take place from 10am to 11.45am. You will learn the craft of crochet embroidery and create your own detailed crochet art pieces using a unique and pattern-free technique. To join this workshop, you will need to bring a 5mm crochet hook and some 8 ply wool. The popular mass exercise commonly found in the parks around China cities arrives at Fed Square. Led by expert instructors from the Federation of Chinese Associations, you can enjoy this simple session that combines dance and gentle exercise. The movements will help to build fitness, balance and mobility. The class is located in the Atrium and runs every Thursday from 10am to 1pm. It is suitable for all ages and fitness levels. 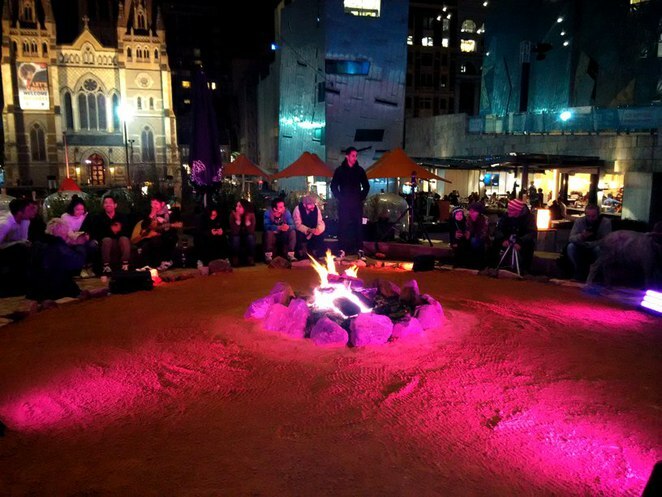 Winter doesn't have to be spent cooped up in the house thanks to Fed Square. This cultural precinct welcomes the season with a large schedule of events, exhibitions and performances that run through June and July. Highlights include the Light in Winter festival which delivers a program of family -friendly art, live music, roving performances and pop up food carts after the sun sets. This biannual market is hidden in Fed Square's undercover carpark near the playground along Riverside Walk. While it is smaller than the Big Design Market in the Royal Exhibition Building, it draws designers from all over Melbourne as well as local visitors and tourist eager for creative and unique products. They range from fashion and jewellery to textile and furniture and everything else in between. This market is undoubtedly one of the top venues for design-savvy shoppers, drawing more than 350,000 over the past 10 years every June and November. Read this article for more details.